Singapore is positioned to support the region's development by financing infrastructure and enterprise in Asia, including bringing in private capital, said Finance Minister Heng Swee Keat yesterday. The country's adoption of digital technology can improve transaction efficiency and raise financial inclusion, he added, calling higher access to financial services "a key priority under our Asean chairmanship". But Mr Heng told DBS' Asian Insights Conference that "proper risk management" is also needed in the light of the Asian and global financial crises of the past two decades. "As we grow and develop our financial sector to serve the needs in the real economy, we must take proper risk management. At the macro level, to maintain our resilience, we must also be prepared for major disruptions in the global financial markets," he said. Mr Heng cited the absence of proper risk management in Asian emerging economies, the United States and Europe as factors behind the recent financial crises - "the consequences when financial flows became decoupled from underlying economic needs". Traditionally, much of the responsibility for infrastructure investment has fallen on the government. But, given the size of these needs, it is not possible for any single government to fund this fully - nor any single bank. We need to crowd in private capital from all sources to accelerate infrastructure development in the region. 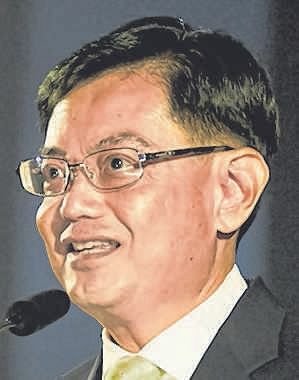 FINANCE MINISTER HENG SWEE KEAT, on boosting the region's infrastructure development. He added that Singapore's financial sector is now "in the position to support the region's development, as the economic centre of gravity shifts back to Asia". "Done well, developments in infrastructure can help boost productivity and economic competitiveness, lift the long-term potential of the region and create a better living environment for our people," Mr Heng said at the event. "Traditionally, much of the responsibility for infrastructure investment has fallen on the government. But, given the size of these needs, it is not possible for any single government to fund this fully - nor any single bank. We need to crowd in private capital from all sources to accelerate infrastructure development in the region." "(The Monetary Authority of Singapore) has revised regulations to facilitate the activities of venture capitalists, and to give finance companies greater scope to support small and medium enterprises. We are also working with industry players to establish private market funding platforms to enable growth companies to gain better access to a wider network of investors."